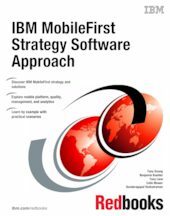 IBM® MobileFirst enables an enterprise to support a mobile strategy. With this end-to-end solution, IBM makes it possible for an enterprise to benefit from mobile interactions with customers, with business partners, and in organizations. There are products available from the IBM MobileFirst solution to support management, security, analytics, and development of the application and data platforms in a mobile environment. Each area is addressed in two parts. The first part contains information about the architectural considerations of each technology, and the second part provides prescriptive guidance. This IBM Redbooks publication provides an in-depth look at IBM Worklight®, IBM Rational® Test Workbench, IBM Endpoint Manager for Mobile Devices, and IBM Tealeaf® CX Mobile. This book is of interest to architects looking to design mobile enterprise solutions, and to practitioners looking to build these solutions.